Amid some recent reports that plans for a 2025 manned mission to an asteroid are floundering, a new report says that NASA officials are giving some thought to an alternative plan put forward by the Keck Institute for Space Sciences last April — send out a small spacecraft to snare a passing asteroid and drag it into orbit around the Moon. The bold 2025 manned-mission plan was announced by U.S. President Barack Obama in April of 2010, but it seems that not much has been done about it since, and it lacks support from both the public and from NASA staff members. This new plan — outlined in a 51-page report prepared by scientists from 17 different government organizations, educational institutions and private space science companies — proposes launching a small, unmanned spacecraft, powered by both solar panels and ion propulsion, to the asteroid belt, where it would trap an appropriate asteroid in what is, essentially, a large bag and then slowly drag that asteroid back to Earth, depositing it into orbit around the Moon. Such a mission would take roughly 10 years to complete, which may seem a long time for little reward. However, while our little 'tug-boat' spacecraft was chugging along with its payload, we would be busy ourselves, building a new space station just beyond the Moon, at Lagrange Point 2 (L2) — an orbital stable point in Earth's shadow caused by the gravitational interaction between the Earth, the Moon and the Sun. This space station would, primarily, be built to give us convenient access to the Moon for scientific missions, mining Helium-3 from the Moon's dark side, and so forth, however it would also give us easy access to anything we placed into orbit around the Moon. Also, sending one of these 'tug-boats' out could be followed by even more, with some sent by private companies such as Planetary Resources. 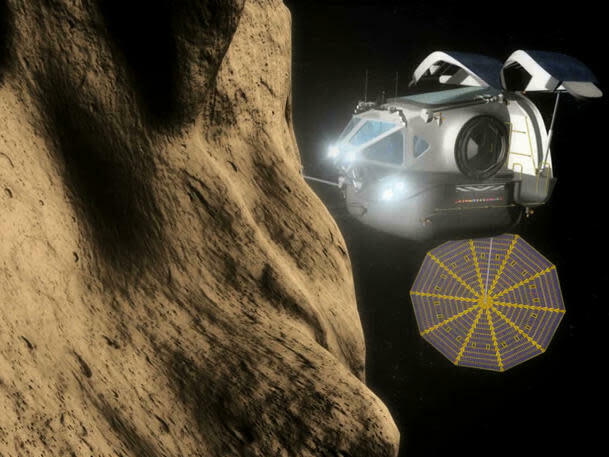 This could set up a continuous stream of asteroids being brought back to us for exploration and mining potential, which would increase the overall reward of the plan vastly. Oh, and for anyone worried about us causing our own doom by entrusting a planet-killer asteroid to a tiny unmanned robot, the scientists proposing this are well-aware of the potential danger. Their proposal involves gathering small, low-density space rocks, around 7 metres wide and of the type known as 'carbonaceous-chondrites'. These would still be valuable for their mineral content, but their small size and low density make it extremely likely that they would just burn up in our atmosphere, should the robot spacecraft drift off course. There's no solid plans for this mission yet, of course, but given that it would be less expensive than a manned mission, it would not put astronauts at risk from cosmic radiation exposure, and it could likely be done with current technologies, the idea does have great potential.